As you know we have been renovating our kitchen, after all our effort at making it look nice I couldn’t have horrible old dog bowls for Dixie in the kitchen could I! 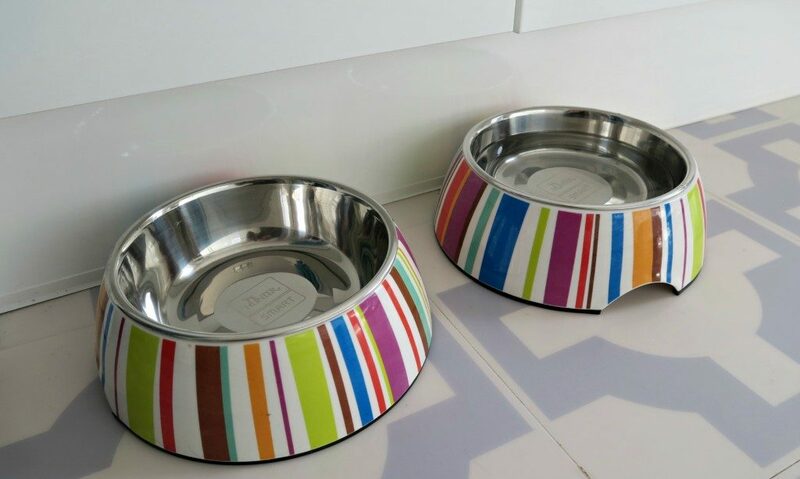 We were sent these Hunter melamine dog bowls for a review, I choose the stripes version but they do them in a range of great colours and patterns. I loved the colours in this design, as we are having a white and grey kitchen it gives a welcomed splash of colour into the room! 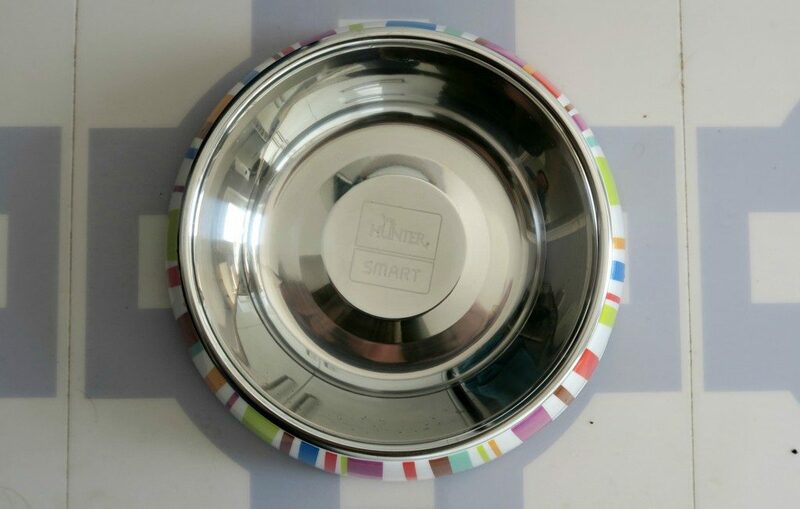 The stainless steel insert bowls can be removed and placed in the dishwasher regularly. This keeps them clean and fresh, and they can also be purchased separately. A fantastic feature of these bowls is that they have a non slip rubber feet on the bottom, so no sliding around the room and not easy to knock over. With puppies they always try and knock it over! 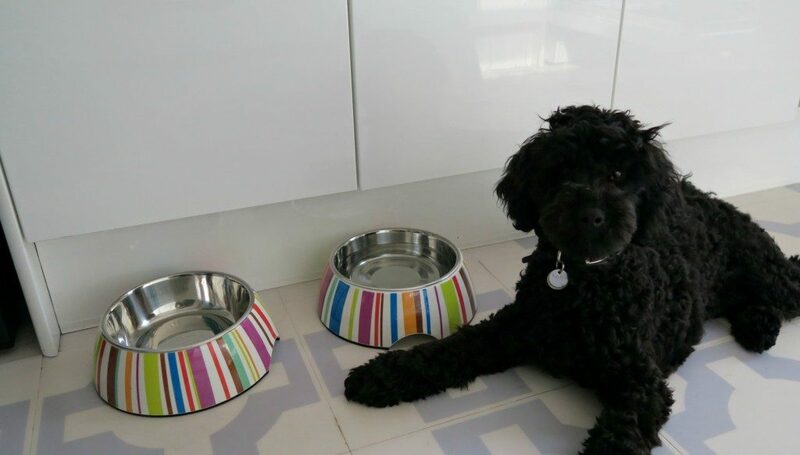 Dixie the future Hearing Dogs puppy loves them, happily feeds and drinks from them and everyone loves her new bowls when they see them. I am really pleased with these dog bowls, they are great quality and I can see them lasting for years and years. They come in 3 different sizes, and prices range from £12.00 to 19.20. For reference I have the 0.7ltr size, which is the largest size. Dixie is a miniature poodle, so could of had a smaller size, but this doesn’t bother her at all! *I was sent these dog bowls for the purpose of this review, however all words are honest and of my own. These look fab and of course they must match!! Love the splash of colour. I’d need the large ones for my water monster. Must fill her bowl 3/4 times a day. I don’t have a dog but my mum does I’ll have to show her these very bright and colourful. aw they are lovely and bright 🙂 we don’t have any pets at the mo, but my son would love a dog!